Directions (1 – 5): What value should come in place of question mark (?) in the following questions? 2. 3 × 36 + 32% of 4500 – 26 % of 1300 =? 4. 42 % of 1800 – 350 ÷ 14 + 143 – (5/9) of 135 = ? The following bar graph shows the number of projects handled by 2 different companies in 6 different years. 6. Find the difference between the total number of projects handled by company A in the year 2013, 2015 and 2017 together and total number of projects handled by company B in the year 2012, 2014 and 2016 together. 7. Total number of projects handled by both the companies together in the year 2014 is approximately what percentage of total number of projects handled by both the companies together in the year 2016? 8. Find the average number of projects handled by company A in all the given years together. 9. 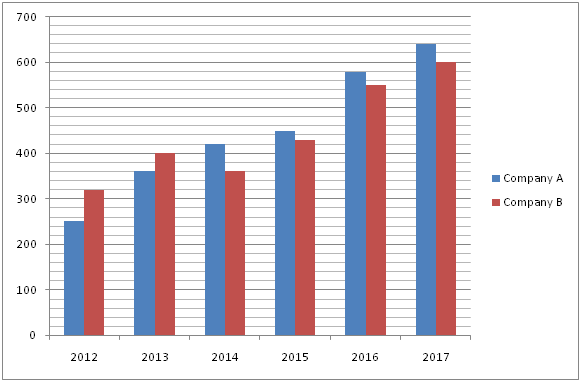 Find the ratio between the total number of projects handled by both the companies together in the year 2012 to that of 2017. 10. Find the difference between the average number of projects handled by company A in the year 2012, 2014 and 2016 together to that of the average number of projects handled by company B in the year 2013, 2015 and 2017 together. 2) 3 × 36 + 32% of 4500 – 26 % of 1300 =? 4) 42 % of 1800 – 350 ÷ 14 + 143 – (5/9) of 135 = ? 6) Find the difference between the total number of projects handled by company A in the year 2013, 2015 and 2017 together and total number of projects handled by company B in the year 2012, 2014 and 2016 together. 7) Total number of projects handled by both the companies together in the year 2014 is approximately what percentage of total number of projects handled by both the companies together in the year 2016? 8) Find the average number of projects handled by company A in all the given years together. 9) Find the ratio between the total number of projects handled by both the companies together in the year 2012 to that of 2017. 10) Find the difference between the average number of projects handled by company A in the year 2012, 2014 and 2016 together to that of the average number of projects handled by company B in the year 2013, 2015 and 2017 together.